For other uses, see Wide Open Spaces (disambiguation). Wide Open Spaces is the fourth studio album and the major label debut of American country music band, the Dixie Chicks. It was their first record with new lead vocalist Natalie Maines, and became their breakthrough commercial success. It received diamond status by the RIAA on February 20, 2003 in the United States, having shipped 14 million units worldwide, while spending more than six years in the Australian ARIA music charts Country Top 20. At the 41st Grammy Awards, the album was awarded 2 Grammy Awards out of 3 nominations. It was awarded Best Country Album (the first of what would be 4 trophies in this category: they would later win for Fly in 2000, Home in 2003, and Taking the Long Way in 2007.) and for Best Country Performance by a Duo or Group with Vocal for the song "There's Your Trouble". (an award the Chicks would win 5 times: in 2000 for "Ready to Run", in 2003 for "Long Time Gone", in 2005 for "Top of the World" and 2007 for "Not Ready to Make Nice", a feat only matched by The Judds.) In addition, the Chicks were nominated for Best New Artist. The CD, next to their next albums Fly and Home were released in the HDCD format. Tommy Nash – electric guitar on "Give It Up or Let Me Go"
Tony Paoletta – steel guitar on "Give It Up or Let Me Go"
Chuck Ainlay - mixing on "Give It Up or Let Me Go"
Billy Sherrill - recording on "Give It Up or Let Me Go"
^ Erlewine, Stephen Thomas. "Wide Open Spaces – Dixie Chicks". AllMusic. Retrieved October 8, 2018. ^ Christgau, Robert (2000). "Dixie Chicks: Wide Open Spaces". Christgau's Consumer Guide: Albums of the '90s. Macmillan Publishers. ISBN 0-312-24560-2. Retrieved October 8, 2018. ^ Harris, Keith (2004). "Dixie Chicks". In Brackett, Nathan; Hoard, Christian (eds.). The New Rolling Stone Album Guide (4th ed.). Simon & Schuster. p. 245. ISBN 0-7432-0169-8. ^ Collins, Roger. "Dixie Chicks". Iomusic News. Archived from the original on 2008-01-16. Retrieved 2008-12-29. ^ "ARIA Charts – Accreditations – 2007 Albums". Australian Recording Industry Association. ^ "Canadian album certifications – Dixie Chicks – Wide Open Spaces". Music Canada. 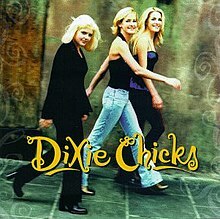 ^ "British album certifications – Dixie Chicks – Wide Open Spaces". British Phonographic Industry. Select albums in the Format field. Select Gold in the Certification field. Type Wide Open Spaces in the "Search BPI Awards" field and then press Enter. ^ Paul Grein (October 30, 2013). "Katy Perry Knocks Miley Cyrus Down a Couple Pegs". Chart Watch. Yahoo. ^ "American album certifications – Dixie Chicks – Wide Open Spaces". Recording Industry Association of America. If necessary, click Advanced, then click Format, then select Album, then click SEARCH.